Cystoscopy (sis-TOS-kuh-pee) is a procedure that allows your doctor to examine the lining of your bladder and the tube that carries urine out of your body (urethra). A hollow tube (cystoscope) equipped with a lens is inserted into your urethra and slowly advanced into your bladder. Cystoscopy may be done in a testing room, using a local anesthetic jelly to numb your urethra. Or it may be done as an outpatient procedure, with sedation. Another option is to have cystoscopy in the hospital during general anesthesia. The type of cystoscopy you'll have depends on the reason for your procedure. Investigate causes of signs and symptoms. Those signs and symptoms can include blood in the urine, incontinence, overactive bladder and painful urination. Cystoscopy can also help determine the cause of frequent urinary tract infections. However, cystoscopy generally isn't done while you have an active urinary tract infection. 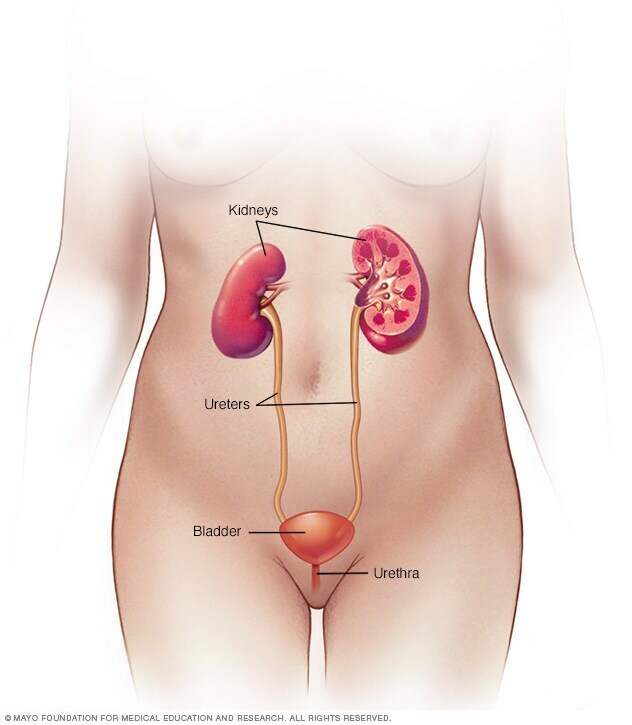 Diagnose bladder diseases and conditions. Examples include bladder cancer, bladder stones and bladder inflammation (cystitis). Treat bladder diseases and conditions. Special tools can be passed through the cystoscope to treat certain conditions. For example, very small bladder tumors might be removed during cystoscopy. Diagnose an enlarged prostate. Cystoscopy can reveal a narrowing of the urethra where it passes through the prostate gland, indicating an enlarged prostate (benign prostatic hyperplasia). Your doctor might conduct a second procedure called ureteroscopy (u-ree-tur-OS-kuh-pee) at the same time as your cystoscopy. 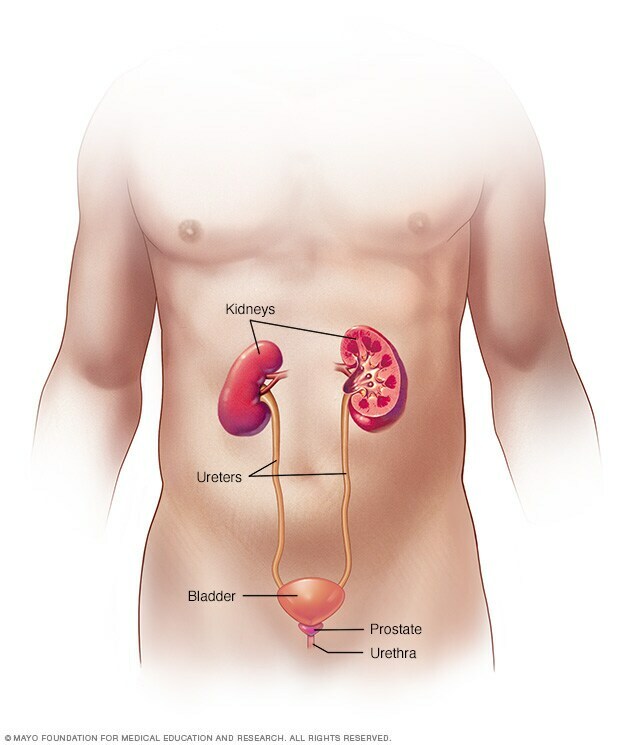 Ureteroscopy uses a smaller scope to examine the tubes that carry urine from your kidneys to your bladder (ureters). Infection. Rarely, cystoscopy can introduce germs into your urinary tract, causing an infection. To prevent infection, your doctor might prescribe antibiotics to take before and after your cystoscopy. Risk factors for developing a urinary tract infection after cystoscopy include advanced age, smoking and unusual anatomy in your urinary tract. Bleeding. Cystoscopy might cause some blood in your urine. Serious bleeding occurs rarely. Pain. You might experience abdominal pain and a burning sensation when urinating. These symptoms are generally mild and gradually decrease after the procedure. Take antibiotics. Your doctor might prescribe antibiotics to take before and after cystoscopy, especially if you have trouble fighting off infections. Wait to empty your bladder. Your doctor might order a urine test before your cystoscopy. Wait to empty your bladder until you get to your appointment in case you need to give a urine sample. If you'll receive an intravenous (IV) sedative or general anesthetic during your cystoscopy, plan ahead for your recovery. You'll need to ask someone to drive you home. During a cystoscopy exam, your doctor inserts a thin, flexible device called a cystoscope through the urethra into the bladder. Cystoscopy allows your doctor to view your lower urinary tract to look for abnormalities in the urethra and bladder. Surgical tools can be passed through the cystoscope, if needed, to treat some conditions. A simple outpatient cystoscopy can take five to 15 minutes. When done in a hospital with sedation or general anesthesia, cystoscopy takes about 15 to 30 minutes. You'll be asked to empty your bladder. Then you'll lie down on a table on your back. You'll likely be positioned with your feet in stirrups and your knees bent. You may or may not need a sedative or anesthetic. If you receive a sedative, you'll feel sleepy and relaxed during the cystoscopy, but you'll still be aware. If you receive a general anesthetic, you won't be aware during the procedure. Both types of medication may be given through a vein in your arm. Your doctor will insert the cystoscope. A numbing jelly will be applied to your urethra to help prevent pain when the cystoscope is inserted. After waiting a few minutes for the numbing, your doctor will carefully push the cystoscope into your urethra, using the smallest scope possible. Larger scopes might be needed to take tissue samples or pass surgical tools into the bladder. Your doctor will examine your urethra and bladder. The cystoscope has a lens on the end that works like a telescope to magnify the inner surfaces of your urethra and bladder. Your doctor might place a special video camera over the lens to project the images onto a video screen. Your bladder will be filled with a sterile solution. The solution inflates the bladder and allows your doctor to get a better look inside. As your bladder fills, you may feel the need to urinate. You'll be encouraged to do so once the procedure is finished. Tissue samples might be taken. Your doctor might take tissue samples for lab testing, or perform various other procedures during the cystoscopy. You might be allowed to resume your daily routine. If you've had sedation or general anesthesia, you might be asked to remain in a recovery area to allow the effects of the medication to wear off before you leave. Hold a warm, moist washcloth over the opening to your urethra to help relieve pain. Repeat as needed. Take a warm bath. However, your doctor might ask you to avoid baths. Ask your doctor if you have concerns. Drink water. Flushing out your bladder can reduce irritation. Try to drink 16 ounces (473 milliliters) of water each hour for the first two hours after your cystoscopy. Call your doctor if you have concerns after your cystoscopy. Your doctor might be able to discuss the results immediately after your procedure. Or, your doctor might need to wait to discuss the results at a follow-up appointment. If your cystoscopy involved collecting a biopsy to test for bladder cancer, that sample will be sent to a lab. When the tests are complete, your doctor will let you know the results. Kurtz M, et al. Etiology and evaluation of hematuria in adults. https://www.uptodate.com/contents/search. Accessed Aug. 8, 2018. Wein AJ, et al., eds. Principles of urologic endoscopy. In: Campbell-Walsh Urology. 11th ed. Philadelphia, Pa.: Elsevier; 2016. https://www.clinicalkey.com. Accessed Aug. 8, 2018. Fok CS, et al. Diagnostic cystourethroscopy for gynecologic conditions. https://www.uptodate.com/contents/search. Accessed Aug. 8, 2018. Cystoscopy and ureteroscopy. National Institute of Diabetes and Digestive and Kidney Diseases. https://www.niddk.nih.gov/health-information/diagnostic-tests/cystoscopy-ureteroscopy. Accessed Aug. 8, 2018. AskMayoExpert. Cystoscopy. Rochester, Minn.: Mayo Foundation for Medical Education and Research; 2018. Gleason JL. Cystoscopy and other urogynecologic procedures. Obstetrics & Gynecology Clinics of North America. 2013;40:773.